The mining sector received another blow in August, falling far more than anticipated by economists. Statistics SA reported on Thursday that mining production fell 9.1% year-on-year in August after a contraction of 5.2% in July. A Bloomberg poll of economists had expected a 4% contraction. The sector was dragged down by iron ore (-19.9% and contributing -2.6 percentage points); gold (-15.5% and contributing -2.2 percentage points); and platinum-group metals (-7.0% and contributing -1.7 percentage points). 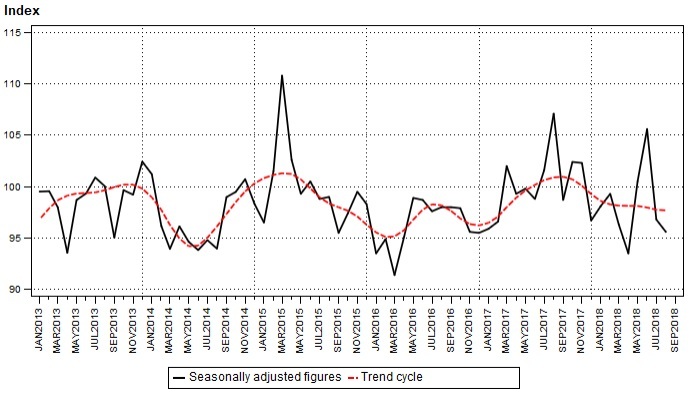 Compared to the month before, mining production fell 1.2% in August following month-on-month changes of -8.3% in July, and increase of 5.1% in June. Meanwhile, mineral sales increased by 4.3% in August. The increase was driven by manganese ore (47.2% and contributing 2.7 percentage points); coal (7.3% and contributing two percentage points); and “other” metallic minerals (86.5% and contributing one percentage point). Despite the country falling into a recession for the first time in a decade, the sector was a positive contributor in the second quarter after a dismal performance in the first. However, the sector’s performance in the third quarter seems to have reversed those gains. The industry has been plagued by concerns around the escalating trade war between the US and China, which may dampen Chinese demand and lower commodity prices, which would knock commodity exporters such as SA. Hopes, however, hinge on the latest iteration of the mining charter. A surge in policy certainty is expected to attract much-needed investment into the sector. FNB chief economist Mamello Matikinca expected slowing global demand and subdued commodity prices to deliver a mild contraction.